FILE - In this Sept. 22, 2014, file photo, a Uniformed Secret Service police officer stands outside the White House in Washington. The Secret Service's cycle of apology, explanation and promises is back - this time, involving an attempt to embarrass a congressman investigating the seemingly non-stop shenanigans. This scandal doesn't involve booze, women or security breaches. It revolves instead around a revelation that scores of Secret Service employees accessed the decade-old, unsuccessful job application of Jason Chaffetz, now a member of Congress, who is chairman of the House Oversight and Government Affairs Committee. The latest incident turned personal when an assistant director of the Secret Service even suggested leaking embarrassing information to retaliate against the Utah Republican, according to a report by the Homeland Security Department's inspector general, John Roth. The actions by the employees could represent criminal violations under the U.S. Privacy Act, according to the IG's report. "It doesn't take a lawyer explaining the nuances of the Privacy Act to know that the conduct that occurred here - by dozens of agents in every part of the agency - was wrong,'' the report said. 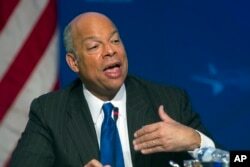 FILE - In this Feb. 22, 2015 file photo, Homeland Security Secretary Jeh Johnson speaks in Washington. Homeland Security Secretary Jeh Johnson, who had apologized to Chaffetz when the report initially surfaced, personally apologized again to the congressman Wednesday, Chaffetz told The Associated Press in an interview on Capitol Hill. Johnson did not disclose whether any employees had been punished. He said in a statement Wednesday that "those responsible should be held accountable'' but did not provide further details. "Activities like those described in the report must not, and will not, be tolerated,'' Johnson said. Clancy also apologized Wednesday for "this wholly avoidable and embarrassing misconduct'' and pledged to hold those responsible for the data breach accountable. 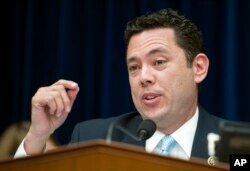 FILE - In this June 16, 2015, file photo, House Oversight and Government Reform Committee Chairman Rep. Jason Chaffetz, R-Utah, speaks on Capitol Hill in Washington. Some information that he might find embarrassing needs to get out. Just to be fair,'' Lowery wrote March 31 in an email to fellow Assistant Director Faron Paramore. Chaffetz applied to join the Secret Service through a field office and was rejected and labeled "Better Qualified Applicant'' for unknown reasons. Chaffetz said he never interviewed with the agency and does not know why his application was declined. Clancy, a retired agent, took the helm of the agency on a temporary basis late last year after then-Director Julia Pierson was ousted following the disclosure of two security breaches. President Barack Obama formally appointed Clancy early this year despite recommendations from an independent review panel that the agency needed a leader from the outside.